DELIVERY ONLY, COLLECTION NOT AVAILABLE! "For any requests call us on 01 832 7467 where our helpful staff will be happy to help you"
Woods Flowerpot is located on the north side of Dublin city with easy access to the city centre and surrounding areas. We deliver through out Dublin. We take pride in being one of Dublin's leading floral designers, creating the latest in floristry trends. Our produce is of the very highest standard and is sourced from around the world. At any given time we would boast stock from, the country garden to the most exotic in fresh flowers. 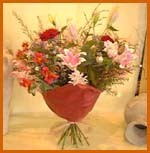 Handtie bouquets..
Large Selection of Cut flowers around the world. We also stock unusual terracotta and clay pots, glassware, gift cards for all occasions, candles and many other gift ideas. 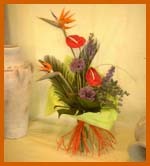 Hand tie bouquets- Whacky arrangements, from the simple to the sublime. We cater for every occasion and every taste.